iriver recently revealed the new ebook product, Cover Story. It's a wonderful and exact name. 'Coz this time the Story comes with a cover to protect the screen. I got a real one in hand. It feels, especially the paging key on the left. As it shows on the photo, the long bar on the left is the paging key. It also takes the responsibility of going back to previous function view and going back home by clicking the bottom or top of it. There is a menu key on the top side of Cover Story and a power key at the bottom. Volume +/- key is placed on the left side of it. The best design should be the cover. If you think the cover is not convenient to take along, you are wrong. It can be attached to the backside with by magnetism. The long hole on the cover just leaves the speaker on the back of Cover Story in the air. Touch screen, G-sensor, is the new feature. 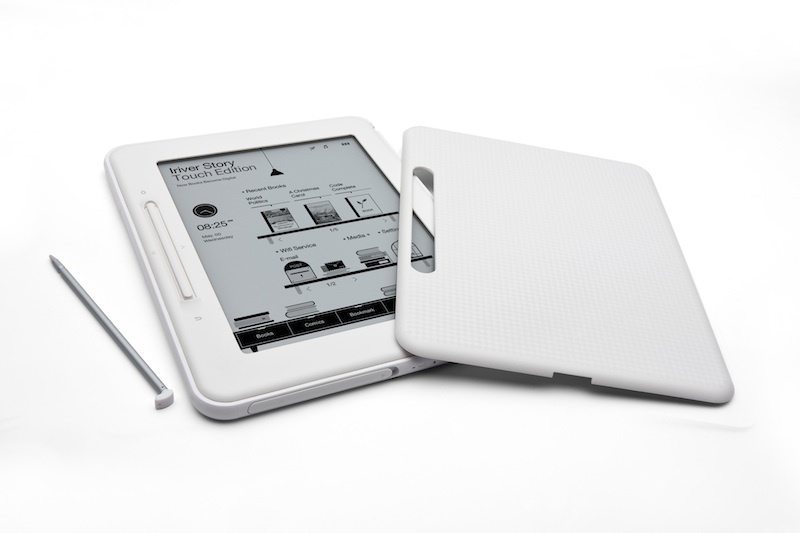 With G-sensor, you can use left or right hand to handle the ebook based on your habit. Memo function is enhanced too. Set the auto memo function to on, when you draw the stylus pen out, the meme pad pops up and is ready to draw any thing on. Compare with Story I tried before, the Cover Story feels like lighter, which in fact is not true. But it's really very handy. Though iPad catches most people's eyes, this kind of ebook product is still attractive. Reasons? I would consider it if it's under $350.